Elizabethtown, Kentucky, September 16, 2015— The Elizabethtown Tourism and Convention Bureau launched a free smartphone app on September 3 that guides visitors through historical downtown Elizabethtown. 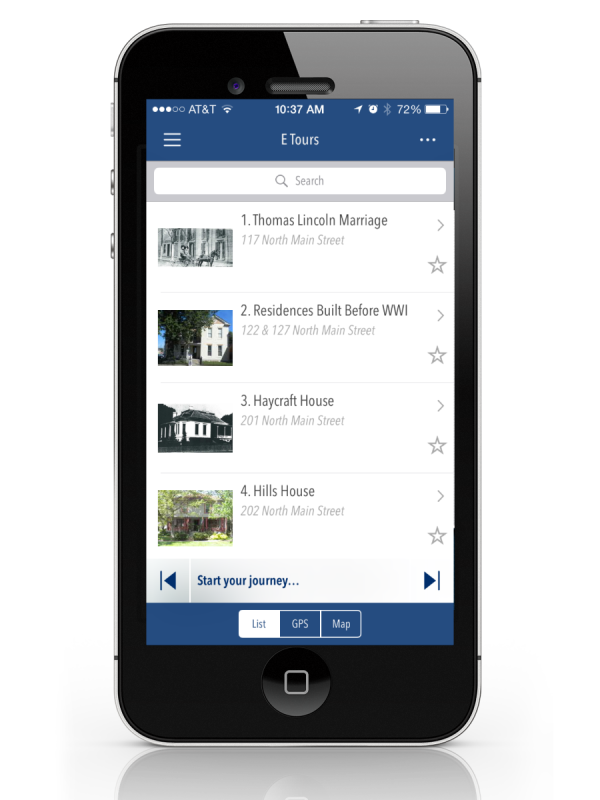 The app, provided by Spatial Adventures, begins downtown and takes the visitor on a self-guided walking tour of prominent historical sites in Elizabethtown. On this tour, the visitor will learn how a cannonball became imbedded in the wall of the first Hardin National Bank, stand in the same spot where Abraham Lincoln’s father and stepmother were wed, and visit the homes of influential American historians, politicians, and military leaders. Audio, descriptions explaining historical significance, modern and historical pictures, as well as a G.P.S. map that guides visitors to each destination accompany all 25 stops. The app is meant to give visitors a similar experience to the Heritage Council’s Charles W. Logsdon Downtown Costumed Walking Tour, which is seasonal. “We’re extremely excited to launch this new walking tour app because it gives visitors a way to experience the rich history Elizabethtown has to offer,” said Jessica Gowen, communications director of Elizabethtown Tourism and Convention Bureau. The free app can be downloaded by searching “Elizabethtown Tours” in Android’s Google Play store and Apple’s iTunes store. Links to download the smartphone app can also be found on Elizabethtown Tourism’s Facebook page (facebook.com/touretown). Characters from the Heritage Council’s walking tour, D.J. Mac Daniels of W.K.M.O., and Kendra Stewart-Scott provided audio for the app. Historical pictures provided courtesy of Johnny Lay.